I've mentioned before that I like to roast an extra turkey breast for Thanksgiving or Christmas so that I can guaranted we'll have leftovers, right? Right. Well, this one I actually made the day after Thanksgiving this year because we went to my mom's house and only came home with enough turkey for approximately one large sandwich. 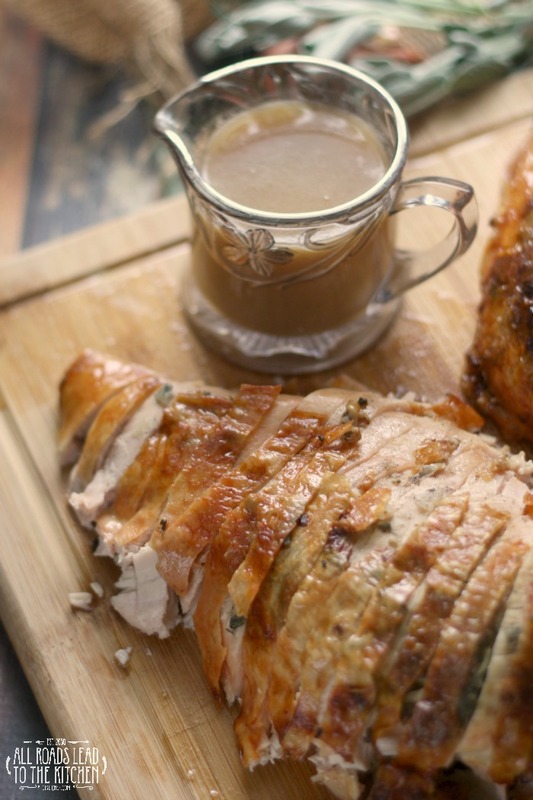 You know what else I love (aside from "extra" turkey) about roasting just a turkey breast? 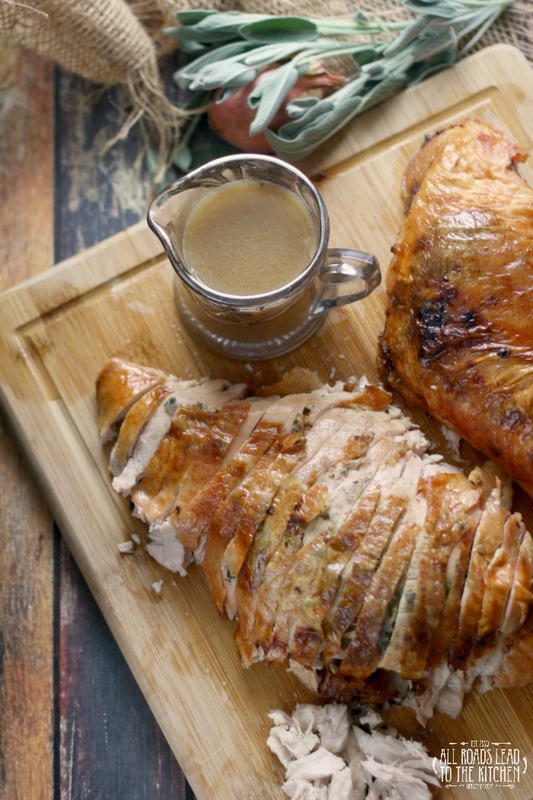 The fact that it's incredibly easy to cook—no man-handling a 14-pound bird! Plus you can customize the flavors any way you like—perfect for experimenting if you have "those" relatives (the unadventurous, scared of new flavors ones) who would pout if the turkey tasted like anything but what they were used to. This method includes a quick and easy compound butter, redolant with shallots and seasonal sage. It's rubbed both under and over the skin which flavors the meat while keeping it moist and helps that skin to crisp up beautiful and golden. 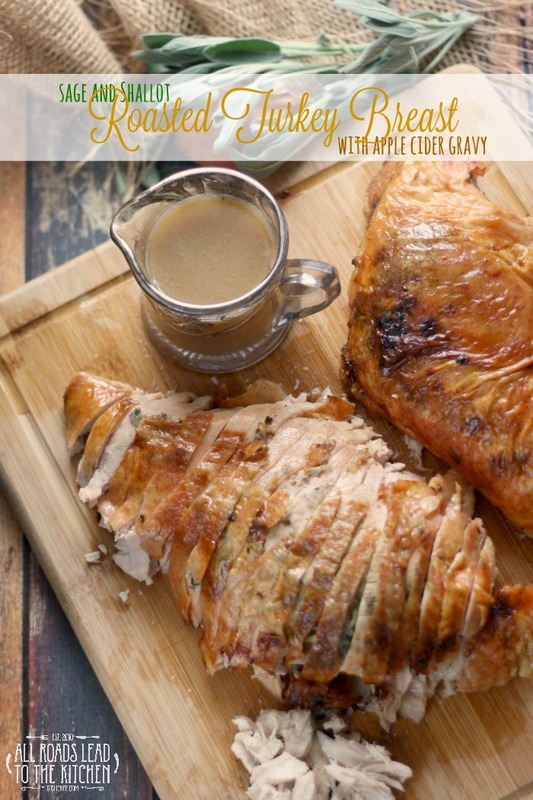 If you're an apple cider fan, don't skip the tangy gravy to serve over or alongside this turkey breast. If you're not, a simple turkey gravy would work just as well. 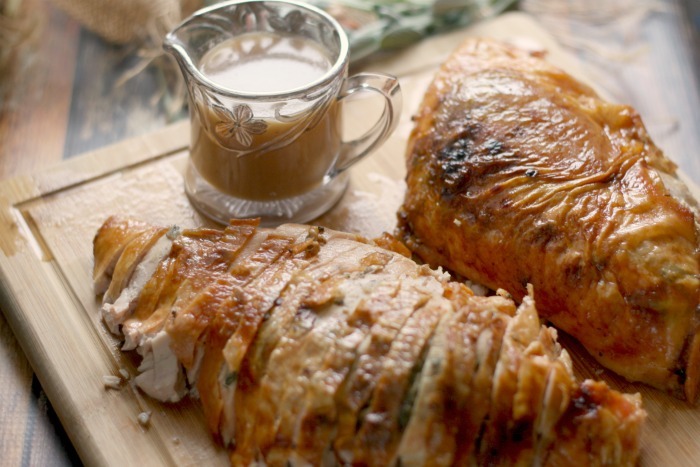 This flavorful and moist sage and shallot roasted turkey breast with apple cider gravy is special enough to make as a small holiday entree, but easy enough to make any day! Preheat the oven to 400° F. Set the turkey breast on a rack in a roasting pan. Combine butter, sage, shallot, salt and pepper in a small bowl and mix until everything is evenly incorporated. Loosen skin over turkey and rub half of the butter mixture under skin and then slather the other half of the butter on top of the skin. Set on the middle oven shelf and roast until an instant-read thermometer registers 165°F when inserted into the thickest part of breast, 1 hour, 45 minutes to 2 hours. Transfer to a cutting board and tent with foil while you prepare gravy. Pour the drippings from the roasting pan into a fat separator. Reserve any juices and add 1 tablespoon of the fat to a small pan set over medium heat. Stir the flour into the fat and cook for 1 minute while stirring. Slowly stir in the broth, cider, and any reserved pan juices. Cook, stirring often, until gravy has thickened up a bit, 3-4 minutes. Taste and adjust seasoning as necessary with salt and pepper. Remove turkey breast from bone and slice. Serve with gravy on the side.